This article is an edited version of a speech given by Mr. Paul Nanton to the May 1982 Annual Dinner of the Manitoba Historical Society. Winnipeg in the spring of 1883 was punch drunk after as wild a bout of speculation in town lots as the country has ever seen. A contemporary observer wrote: “Hundreds were ruined and thousands were impoverished ...” This was the moment when Augustus M. Nanton of Osler & Hammond, Toronto, arrived on behalf of The North of Scotland Canadian Mortgage Company of Aberdeen. The Scots had invested in Ontario farm mortgages through Osler & Hammond since 1876 and now wanted to know if the North West was the coming field. Nanton covered the prairies, mainly on horseback or by buckboard, and reached the conclusion that no country could have better prospects. His report brought the two heads of the Aberdeen house across the sea for a personal inspection. They were convinced, and as a consequence, millions of dollars of Scottish money were made available to western farmers in the coming years. Nanton was only 23 years old at this time, but he had already worked ten years. His father, a barrister educated at Eton and Oxford and a partner of Sir A. T. Galt, had died at 42 leaving five children and heavy debts. 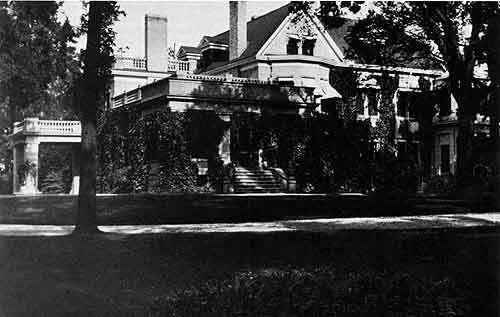 His mother, daughter of Sheriff William Botsford Jarvis, had grown up in the family home, Rosedale, after which the district of Rosedale in Toronto was named. He, himself, had left school at 13 to help the family finances, working for two years as office boy in a bank and then with Pellatt & Osler, soon to become Osler & Hammond. He must have worked hard and well, for in 1881 he had been appointed Canadian secretary for the Aberdeen interests at a salary of $1,500 plus a bonus of $250 “in appreciation of your services.” But he hadn’t limited himself to office work. Early on, when his salary had been $300 a year he had made $200 for cleaning out a grocery store and sleeping under the counter at night as a sort of night watchman. The extra money sent his younger brother to Royal Military College. As well, he had joined the Queen’s Own Rifles, rowed with the Argonaut Rowing Club, and crewed aboard a yacht at Oakville. And when the future builder of Casa Loma, Henry Pellatt, was married in 1881, Nanton had been best man. Osler, Hammond & Nanton entered the North West representing a lot of money, but with an entirely different philosophy to that of “quick profits.” They brought standards of thoroughness, initiative and scrupulous honesty from which they never deviated, and became an important link between eastern Canadian/British finance and western development. Financing the construction of “feeder” rail lines and selling railway farm lands and town sites became prime activities. Nanton was, deeply involved in them. In the 1890s he oversaw the financing, managing or salvaging of four railways on the prairies, and he was constantly on the train, heading west or to Toronto or Montreal. Those four railways were ultimately bought by the CPR, but their initial financing had been arranged largely through British interests, with OH & N the agents for the sale of their land grants. In 1900 OH & N became agents for the sale of Galt Coal throughout the prairies and, in the first year, sold 50,000 tons. This was part of the Galt family interests in southern Alberta, and Nanton also became Managing Director of their Alberta Railway & Irrigation Company. For seven years he spent three days a month in its Lethbridge office. The extent of his participation in western development is shown by the fact that twelve cities and towns have streets named after him, and the community of Mosquito Creek, between Lethbridge and Calgary, became the Town of Nanton. By the early twentieth century, Nanton had many business interests. He was on the boards of about thirty corporations or associations. Two of the companies in which he held directorships were the CPR and the Hudson’s Bay Company, great commercial organizations that had played a major role in developing Canada and especially western Canada. He took pride in being associated with the “World’s Greatest Transportation Company,” and with the oldest commercial organization in the worldthe letters H.B.C., it was said, stood for “Here Before Christ!” He was one of those Winnipeg businessmen of broad perspective, one of the group that directed the massive financing of and servicing for the influx of settlers that were then pouring into the West, a group from which import-ant national corporations chose most of their western directors. During the pre-War years, Nanton’s personal life had had its ups and downs. In 1887 his young wife of a year died just three weeks after the birth of their daughter, a death almost certainly caused by a doctor’s carelessness. For the next several years, work became his sole passion and outlet. But in 1894, a year in which he was ill for several months, in which business was down, and in which several of the key men in the west had either taken to the bottle or become, for some other reason, hard to handle, Nanton fell in love with Ethel Clark, 19 years old and beautiful and just back from two years of study in Germany. They were married the following year and went on to have thirty marvellous years as man and wife. From August 4, 1914, until late 1918, Nanton’s business and even personal interests had to be less important than they had been, because he was committed to victory in the Great War. Two of his partners and fifty of his staff of one hundred fifty joined the forces; he gave more than half of his money to the war effort; and he undermined his health through extreme overwork. 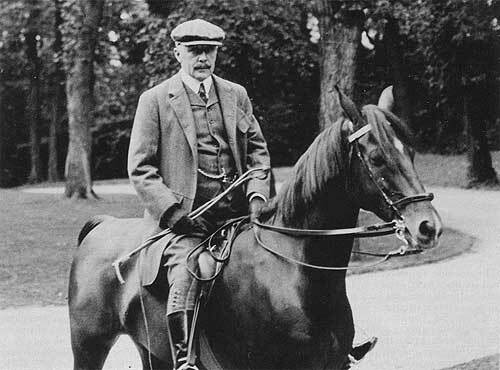 In recognition of his war services, he was knighted in 1917. Before the War his home, Kilmorie, was filled with life for both grownups and children; once peace returned, the outstanding occasions were the three dinner parties and dances given between 1919 and 1924 for the Prince of Wales. But during the years of conflict, Kilmorie played a different role. Upstairs, the music room (ball room) was filled three days a week with women who knitted and sewed and shipped tons of socks, sweaters, scarves, etc., for the men of the 27th Battalion in France. Downstairs, an average of thirty men from the 28th Battalion of Regina came seven nights a week during the months they were in training in Winnipeg. They greatly enjoyed the two bowling alleys, shooting gallery, full sized English billiard table, ping pong and tables for bridgeas well as the massive sandwiches and jugs of cocoa that appeared at 9 p.m. Within days of the outbreak of war, the Canadian Patriotic Fund was formed to help the dependents of those enlisting. A private’s pay was $1.10 a day plus a small separation allowance for his family and, with thousands enlisting, there was need for immediate help. Ultimately there were 1,000 branches of the Fund across Canada, manned by volunteers, with personal contacts in tens of thousands of homes and detailed records of each family. By mid-1916 Nanton was worrying about the need for conscription but it was 1917 before he began to demand it. He addressed large meetings, saying that in ordinary times he hated the idea of conscription, but these were not ordinary times. “For three years our bravest and best have been fighting for us and are now calling on us to send them reinforcements.” He was strongly against a wartime election on the issue because it would heighten division in the country. But when Laurier turned down the offer of a coalition with Borden and an election became inevitable, Nanton took the chair at the mass meeting of 5,000 in Winnipeg on October 22, which launched the campaign. It was the only time he ever appeared on a political platform. The speakers were Arthur Meighen, J. A. Calder and T. A. Crerar, all members of Borden’s recently formed Union cabinet. The previous week he had been in Alberta, accompanied by the Provincial Treasurers of Manitoba and Alberta, organizing committees to lead the Victory Loan Campaign of 1917. The War by then was costing Canada $1 million a day. The money had to be borrowed, and from Canadians. Nanton was the only westerner on the Dominion Executive as well as Chairman of the Manitoba Committee. He saw to it that, throughout the prairies, committees were formed that gave outstanding leadership to the Victory Loan Campaigns of 1917, 1918 and 1919. For the first time, thousands bought bonds instead of putting their savings in land, a mortgage or a sock. A three mile parade launched the Winnipeg campaign and half the city was on the streets to applaud. The first application for bonds, for $1 million, came from the Hudson’s Bay Company, and by the end of the campaign, Manitoba had raised $32million. This was equal to $71 per head of population compared to the national figure of $58 per head. In the second and third campaigns the number of Victory Loans canvassers in Manitoba was increased from 1,000 to 2,500, fortunately so because in 1918 all public meetings were cancelled due to the flu epidemic and the many roads closed by blizzards, while in 1919 there was a post-war feeling of let-down. Yet new records were set in both campaigns. In the three campaigns, Manitobans invested $120 million in Victory Bonds. It marked a major advance in social and financial maturity. 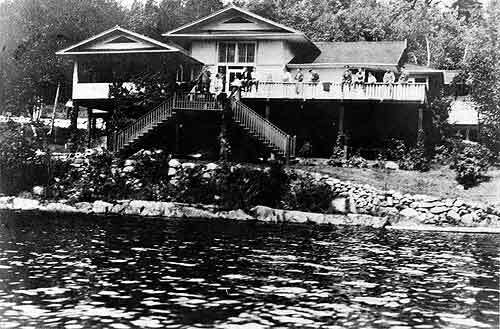 During the summer of 1917 military hospitals across Canada were filling up with wounded soldiers brought back from England and France, and Sir Augustus and Lady Nanton decided that their summer home at the Lake of the Woods could be turned into a kind of convalescent home for some of these men. They made the offer to the Tuxedo Military Hospital with one conditionthat the medical staff should be supplied by the hospital but everything else should be supplied by them. The offer was accepted by the Hospital and by Ottawa, and immediately the race began to build the necessary additions before freeze-up. In early June, 1918 the first fifty men got off the train at Keewatin and were brought to the house in launches. Everything was ready. A sleeping house was built to accommodate thirty men, the top of the boat house was rebuilt to house ten, the kitchen, ice house and toilet facilities were tripled. An army doctor, nursing sister, two members of the Voluntary Aid Detachment, a cook and two assistants were there. At the men’s disposal were two sturdy rowboats with small outboard motors and two rowboats with oars. Twice a week a launch would take ten to fifteen men out into the Lake for a picnic. The operation continued throughout the summers of 1918 and 1919. The financial and business community, which had led the Patriotic Fund and Victory Loan campaigns to outstanding success, now formed the Citizens’ Committee of One Thousand to maintain the essential services closed by the Strike. (A. L. Crossin, Vice Chairman of the Victory Loan Campaigns, became Chairman of the Committee.) They were capable and committed men who felt strongly about the country and the sacrifice of war. They had regarded labour’s opposition to conscription as betrayal of the men overseas, and they believed that this strike was Communist inspired. A general strike was, to them, an affront to the democratic forms of society and had to be stopped. Nanton was the leading financier and, as President of Winnipeg Electric, the leading employer in Winnipeg; consequently sections of labour turned on him. At one of the mass meetings he was attacked and a man shouted out to burn down his house. For a time he and his chauffeur, gardener and under-gardener, took turns patrolling the five acre grounds of Kilmorie every night while his wife and daughters slept with friends. No move was made against Kilmorie but the barn on his farm at Rosser was burned down and twenty horses destroyed. It was an incendiary fire. The strikers lost, but, in the long run, the workers won. Frontier conditions and attitudes were no longer acceptable though some historians have overlooked the fact that “frontier conditions,” initially, are inevitable in a new country. Changes were overdue and were coming. But the way they happened caused class division to remain a blight on the life of the city for years. Following the War an organized effort was made to persuade farm owners in the west to sell their vacant land lying close to the railways. There were thirty million acres of prime land lying idle. A non-profit association was formed to carry out the task, but ran into difficulties. In the spring of 1923 a new Canada Colonization Association was formed composed of senior officials of Government, Canadian Pacific and the newly-established Canadian National Railwaysand Nanton was asked to be Chairman. He had not recovered from his exhaustion following the War and was anxious to lighten his responsibilities, not increase them. But, finally, he agreed. The insistence that he was the man to pull the committee together, even though he was closely identified with one of the three, often conflicting, elements, was signal proof of his reputation. When Sir Edmund Osler, a business associate of forty years, died in the summer of 1924, Nanton succeeded him as President of The Dominion Bank. The newspapers in eastern Canada, and several in the United Kingdom, commented on the significance of this choice. Western Canada was now producing men who would give leadership in the national centres of finance and it was felt that the whole of Canada would benefit from Nanton’s perspective. When his death was announced on April 24th every flagpole visible in Winnipeg carried a flag at half mast and office buildings across Canada followed suit. The CPR supplied a special train to bring his remains, his family and business friends from Toronto to Winnipeg for the funeral service. A guard of honour of six hundred Winnipeg Electric employees lined the street leading from St. Luke’s Church. The whole of Winnipeg seemed to have been affected. 2. Chairman’s Annual Report, Aberdeen, 23 December 1884. 3. Joseph Schull, “100 Years of Banking in Canada,” Copp Clark, 1958. 4. Chairman’s Annual Report, Aberdeen, 28 December 1897. 5. “Canadian Patriotic Fund, 1914 to 1919.” Official Publication, Ottawa.